The LTC1732-8.4 is a complete constant-current/constant-voltage linear charge controller for lithium-ion (Li-Ion) batteries. Nickel-cadmium (NiCd) and nickel metal-hydride (NiMH) batteries can also be charged with constant current using external termination. Charge current can be programmed with ±7% accuracy using external sense and program resistors. An internal resistor divider and precision reference set the final float voltage with ±1% accuracy. 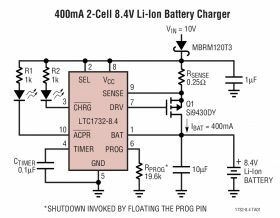 When the input supply is removed, the LTC1732-8.4 automatically enters a low current sleep mode, dropping the battery drain current to 10µA. An internal comparator detects the end-of-charge (C/10) condition while a programmable timer, using an external capacitor, sets the total charge time. Fully discharged cells are automatically trickle charged at 10% of the programmed current until battery voltage exceeds 4.9V. The LTC1732-8.4 begins a new charge cycle when a discharged battery is connected to the charger or when the input power is applied. In additon, if the battery remains connected to the charger and the cell voltage drops below 8.05V, a new charge cycle will begin. The LTC1732-8.4 is available in the 10-pin MSOP package.